Retracement may equal, but never pass the origin of Wave 1. Wave 2 normally takes the form of a Zigzag. It can also develop into a Flat or Expanded Flat. At times, internal wave B may be a triangle. Unlike wave 4, however, wave 2 cannot consist entirely of a triangle, a triangle in wave 2 must be restricted to an internal wave, such as B wave, or in a complex correction X wave. Triangles always precede the final wave in a sequence. (4 precedes 5, B precedes C, X precedes Y) A triangle contained within wave 2 will always resolve in the direction of the correction, not the trend. Wave 2 can become a complex correction, but does so far less frequently than wave 4. Before entertaining the idea that Wave 2 has become a complex correction you should first consider whether Wave 2 has already ended and you are instead watching the development of a 2nd wave 1-2 structure. A failed new high or low is more frequently the action confirming that wave 2 is working. As shown in the diagram below, this confirmation is actually the development of the lesser degree 1-2 waves of the a wave of the correction and is confirmed as wave 3 develops and moves past the wave 1 pivot. Wave 1 ends after 5 waves and is followed by a wave 2 retracement. 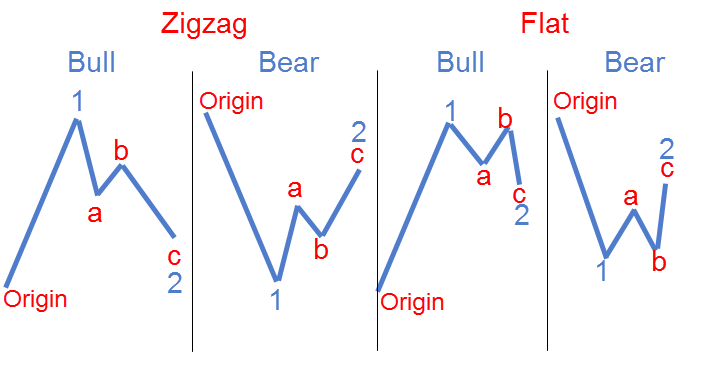 Since wave 2 is most commonly a zigzag, and one of the common traits of a zigzag is a steep and fast A wave, your first signal that wave 2 has started is often the "oh, crap signal," when the price reverses hard in a matter of a few bars or opens down significantly. 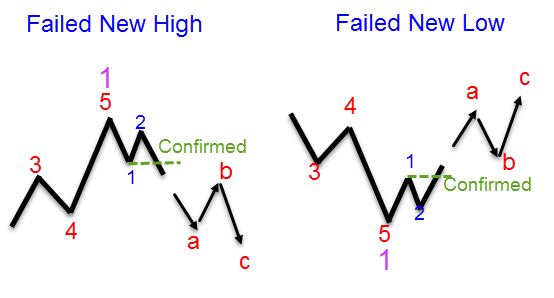 Trading Wave 2 typically takes one of two forms. Either you are using confirmation of wave 2 to exit a trade you were in during wave 1, or your prediction of the depth of correction will be sufficiently profitable to make a trade. Depth of retracement is generally unpredictable other than to follow the general statistics. NORMALLY, you can expect the wave 2 range to be the prior wave 4 low (wave 1.4) and the .618 level. Using Wave 2 confirmation as an exit for a trade is common practice and can be part of a sound trading strategy. Entering a trade for wave 2 is risky business for a number of reasons. You might have missed an extension in Wave 1 and it isn't really finished. You are trading against the trend, which in itself is ill-advised. There is no reliable means to predict how deep the wave 2 retracement will move. Sure, it could be .618 of wave 1, but it could also be .382. When wave 2 is finished, Wave 3 can at time start off like gangbusters. You may not have sufficient time to exit and maintain any profit, or worse, your profit is quickly turned into a loss on a reversal gap the next day. All of this having been said, you can certainly increase your odds of success by trading larger degree waves that are expected to be deep and take several hours or days to complete, but even that is no guarantee. So, a word to the wise: If you don't clearly understand the risk, don't try to trade in wave 2. As an Expanded Flat (A3-B3-C5)- .236 of Wave 1. Statistically, 73% of Wave 2's will retrace to at least .5 to .618 and 15% as far as 100% of W1. I'm not sure where these statistics came from, but they seem appropriate in our experience as far as larger degree waves are concerned. With respect to smaller internal waves, especially in parent waves 3 and 5, it is far more common to see a .382 to .50 retracement. It is very important to note that the depth of wave 2 is a preview of the buying or selling pressure of the market. A shallow Wave 2 retracement predicts stronger wave 3s. When Wave 2 is an expanded flat, you can pretty well count on W3 to achieve a 2.618 multiple of W1. Expect big moves after flats. 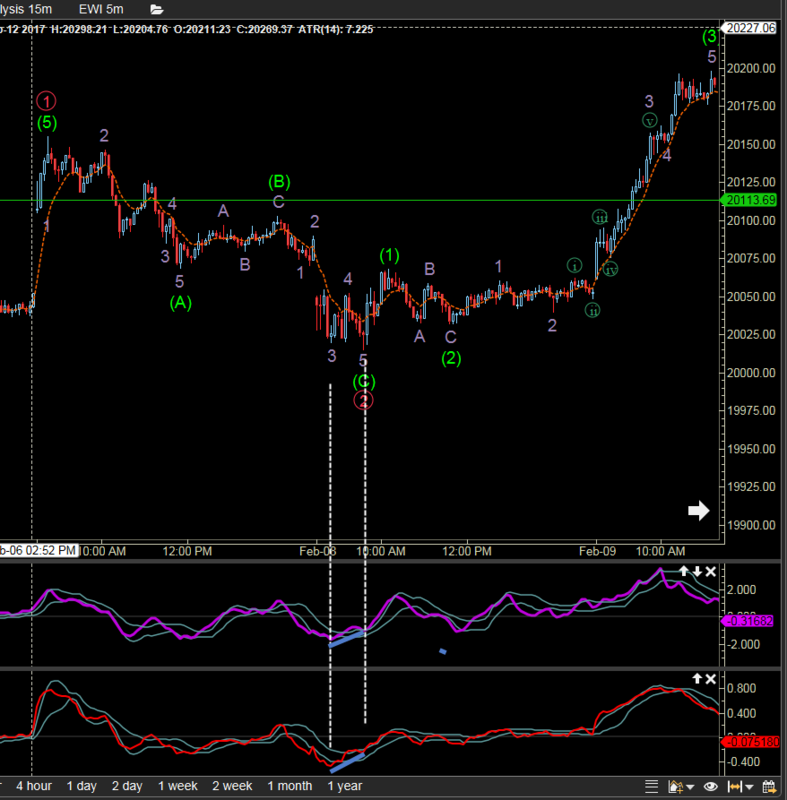 As we mentioned with the end of wave 1, indicators will typically be showing a divergence beginning at wave 4. Wave 5 moves on but the divergence continues in wave 5. This explanation applies to wave 2 and all other waves as well. The wave 5 of C wave in a wave 2 correction frequently shows divergence.